Both presidents spent more on defense than any administration since WWII. Few people are aware that Obama spent more than Bush on defense, roughly $700 billion a year compared to $500 billion by Bush. The military budget is second to Social Security as the largest component in the U.S. government’s budget. Bush launched the Iraq and Afghanistan wars in response to the 9/11 terrorist attacks. The War on Terror has cost more than $2.4 trillion since 2001. Obama cut back both wars. He relied instead on military intelligence and technology to get Osama bin Laden. Regardless of the strategies used, U.S. involvement in the Middle East may never end. Much of the problems in the Middle East continue because of the Sunni-Shia split. Bush and Obama used expansionary fiscal policy to combat recessions by stimulating economic growth. Bush fought the 2001 recession with tax cuts. He designed the first tax rebate, Economic Growth and Tax Relief Reconciliation Act, to jump-start consumer spending. The administration mailed EGTRRA checks to households in August 2001. By then, the economy had already begun to improve. In 2004, he launched the Jobs and Growth Tax Relief Reconciliation Act tax cuts. They helped businesses recover from the downturn caused by the 9/11 attacks. But tax cuts aren't the most effective way to create jobs. There are better unemployment solutions. In 2005, Bush missed an opportunity to react quickly to Hurricane Katrina. Some estimates said the storm's economic impact was $200 billion. As a result, gross domestic product fell to 1.5 percent in Q4 2005. Bush then added $33 billion to the Fiscal Year 2006 budget to help with cleanup. But he should have done it much earlier. That might have boosted growth in 2005. Bush left it up to the Federal Reserve to address the 2007 banking crisis with monetary policy. After Lehman Brothers collapsed in 2008, he agreed to Treasury Secretary Hank Paulson's suggested TARP bailout. Obama passed the $787 billion Economic Stimulus Act. This act created jobs in education and infrastructure, ending the recession in the third quarter 2009. Obama used the TARP funds to subsidize homeowners stuck with upside-down mortgages. Both presidents took action to address rising health care costs. The cost of Medicare and Medicaid threatened to eat the budget alive. The No. 1 cause of bankruptcy is health care costs, even for those with insurance. That's because many policies at the time had annual and lifetime limits that were easily exceeded by chronic illness. Bush created the Medicare Part D prescription drug program. It helped seniors with prescription drug costs up to a point, known as the "doughnut hole." Bush didn’t create any tax increases to fund this program. As a result, it added $550 billion to the debt. In 2010, Obama pushed through the Affordable Care Act. Its goal is to reduce health care costs. The benefits it provides were realized after 2014. Obamacare closed the Medicare doughnut hole. More importantly, it provides health insurance for everyone. That cuts health care costs by allowing more people to afford preventive health care. They could treat their illnesses before they become catastrophic. That means fewer people rely on expensive emergency room care. The costs of Obamacare were paid for with a variety of taxes. Both Presidents advocated more free trade agreements. Bush completed the Central American-Dominican Republic Free Trade Agreement in 2005. He also signed bilateral agreements with Australia in 2005; Bahrain, 2006; Chile, 2004; Jordan, 2001; Morocco, 2004; Oman, 2006; and Singapore, 2004. The Obama administration negotiated the Trans-Pacific Partnership. It didn't finish the Transatlantic Trade and Investment Partnership before the end of his term. Congress awarded him "fast track" trade promotion authority in June 2015. Obama had success with bilateral agreements in South Korea in 2012; Colombia, 2011; Panama, 2011; and Peru, 2009. These bilateral trade agreements granted favored trading status between the United States and these countries. Obama supported the passage of free trade agreements as part of the American Jobs Act. But he didn't fulfill his campaign promise to review all trade agreements to make sure they didn't cause job losses. Bush passed the 2005 Bankruptcy Prevention Act. The Act made it difficult for people to declare bankruptcy. As a result, they relied on home equity loans instead. After the Act passed, mortgage defaults rose 14 percent per year. That worsened the subprime mortgage crisis. Obama outlined his economic policies in the 2008 presidential election campaign. Once elected, he named former Federal Reserve Chairman Paul Volcker, who advocated tougher financial restrictions, to head his Economic Advisory Panel. The Dodd-Frank Wall Street Reform Act made another financial crisis less likely. It regulated non-bank financial companies, like hedge funds, and the most complicated derivatives, like credit default swaps. It also regulated credit, debit, and prepaid cards. It ended payday loans with the Consumer Financial Protection Bureau. Both presidents ran up record-setting budget deficits. Bush's deficits were $3.3 trillion, an increase of 57 percent. Obama's deficits were $6.9 trillion, also a 57 percent increase. The Bush FY 2008 budget was the last budget untouched by recession-fighting. Even so, it ran a $459 billion deficit to fund the War on Terror. This amount was shockingly high at that time. President Bush's last budget, for FY 2009, started out with a $407 billion deficit. Congress approved $350 billion to fund TARP, but only $151 billion was spent in FY 2009. After Obama took office, Congress added the Economic Stimulus Plan to end the recession. That added $253 billion in FY 2009. Revenue came in almost $600 billion lower than expected. As a result, the FY 2009 budget deficit was $1.4 trillion. This was the largest budget deficit in U.S. history. Obama's FY 2010 budget deficit was $1.294 trillion. The FY 2011 budget deficit topped that at $1.3 trillion. It was delayed by the Republican House until a mere $38 billion was trimmed in March 2011. As the economy improved, each year's deficit was lower. As presidents are responsible for budget deficits, it’s useful to compare the deficit incurred by president. Because of all this, the U.S. debt rose the most during Bush’s and Obama’s terms. That's because each year's budget deficit adds to the debt. Increases in the Social Security Trust Fund don’t get counted in the deficit. This “off-budget revenue” lowers each year's deficit but not the debt. That means a president's contribution to the debt will be higher than all his deficits combined. 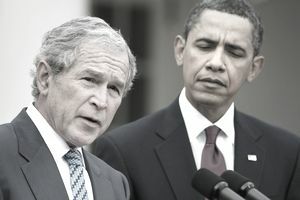 Obama added $9.6 trillion to the debt, while Bush added $5.8 trillion. Find out why this is different from the deficit in Debt by President.